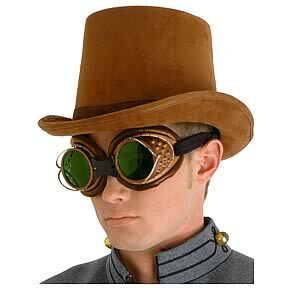 Join the retro-future world of Steampunk, with this Brown Suede Coashman Hat! Inspired by a melding of Victorian-era Britain and the fantastical designs of authors like H.G. Wells and Jules Verne, this authentic coachman hat is the perfect addition to your Steampunk costume! One size fits most adults. Measures about 13-inches long. Ages 14 and up. Order yours today! The inside of the hat measures approximately 24-inches in circumference (8-inches long x 7-inches wide).